Did you get your fill of toys during the holiday season, or are you always looking for another reason to add to your collection? Pook & Pook and Noel Barrett are happy to help, with their upcoming Online Only Toy Auction on February 9th, 2019. This special Saturday sale will see over 550 items cross the block and will be hosted on two online bidding platforms - bidsquare.com and liveauctioneers.com. This auction is the latest of many in collaboration with Mr. Noel Barrett. Known to many across the country as the colorful toy expert on Antiques Roadshow, Mr. Barrett has been sharing his life’s passion with fascinated viewers for years, encouraging curiosity and wonder in children of all ages. Some highlights in February’s sale include a carry-over of objects from Pook & Barrett’s December catalog sale. Worthy of mention is the expansive offering of steam toy accessories, which includes manufacturer names such as Mohr & Krauss, Carette, Falk, Schoenner, Marklin and Carette. The February grouping is an affordable selection with something for beginner collectors and those who are looking to fill out an already existing collection. Another carry-over from December’s auction is a grouping of fire-related toys, with examples by Dent and Ives. A boon to the sale is a large grouping of toys from a single-owner collection, from Jonathan Barrow of Los Angeles, California. Crossing the block from this West Coast grouping will be a number of Japanese tin friction cars, Japanese airplanes, and Japanese battery-operated race cars. Tin lithographed wind-ups comprise a good portion of the sale, with names such as Marx, Bing, Strauss, Lehmann on offer. Lithographed figures with complex actions add interest to the auction, especially the Arnold tin lithograph clockwork MAC 700 daredevil motorcycle. When wound, the daredevil rider jumps off his motorcycle with his limbs flailing, then hops backs on and zooms off. ($300-$500). Racecars, hot rods, Jeeps, tanks, trucks, Cadillac’s, and coupes will all motor across the auction block on Saturday. A variety of childhood classics fills this sale and includes dolls, teddy bears, board games and more. The C. M. Bergman Simon & Halbig bisque head doll comes clutching her own teddy bear ($300-$400) as does the Kestner German bisque head doll ($200-$300). Bears in all shapes and sizes include early 20th c. teddies, cuddly Steiff teddies, and one wind-up trapeze bear. Other doll related accessories are lots of doll house miniatures, dollhouses, and room boxes. Interspersed between teddies and dolls are collections of cap guns, Hubley still banks, and charming hood ornaments. Holiday items in the sale include two composition Santa Claus figures, numerous lots of Easter bunny rabbit candy containers, collections of Santa figurines, and a few sparkling Christmas ornaments. Lionel trains are well represented in the sale, many with their original boxes and miscellaneous train accessories. The online catalog for February’s Online Only Antique Toy Auction may be viewed at www.pookandpook.com, bidsquare.com, or liveauctioneers.com. All bidding for this auction is online at Bidsquare and LiveAuctioneers. A gallery exhibition is scheduled for Wednesday, February 6th through Friday, February 8th from 10am – 4pm. Bidding for the sale will open online on Saturday, February 9th at 9am. Pook & Pook and Noel Barrett’s next Antique Toy Auction is slated for Spring 2019 in Downingtown, Pennsylvania. 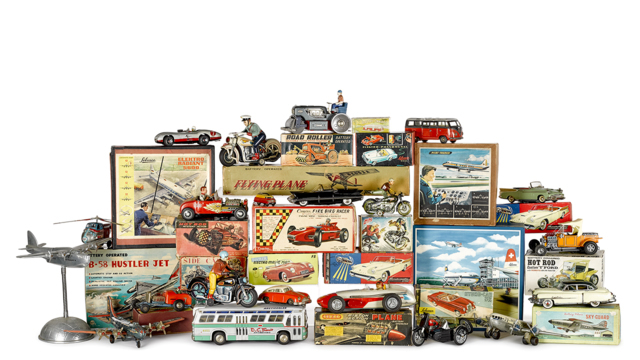 Do you have an object you’re interested in consigning for any upcoming Antique Toy auctions? Pook & Pook, Inc. with Noel Barrett is always accepting quality consignments! To speak with an appraiser, call (610) 269-4040 or email photos to toys@pookandpook.com. The office is not open for pick-up on February 9th. Payment and pick-up hours are Monday to Friday, 9am to 4:30pm.